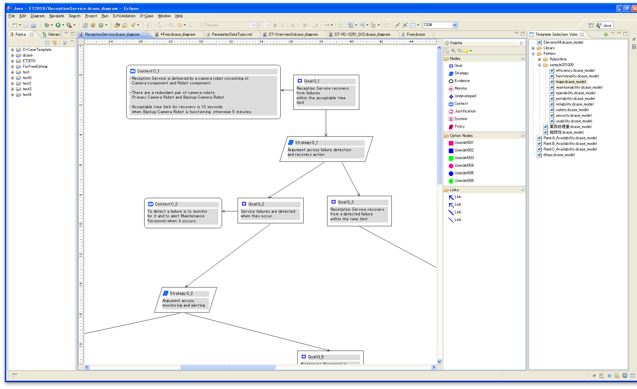 D-Case Editor is a typed assurance case editor. which has been implemented as an Eclips plug-in using Eclipse GMF. The key features are as follows. And more features are being developed. System assurance has become a great importance in many industrial sectors. Safety cases ( assurance cases for safety of systems ) are required to submit to certification bodies for developing and operating safety critical systems, e. g., automotive, railway, defense, nuclear plants and sea oils. There are several standards, e. g. EUROCONTROL , Rail Yellow Book  and MoD Defence Standard 00-56, which mandate the use of safety cases. Furthermore, recently medical device industry has also focused on assurance cases . There are several definition for assurance cases . We show one of such definitions as follows . "a documented body of evidence that provides a convincing and valid argument that a system is adequately dependable for a given application in a given environment." What is GSN ( Goal Structuring Notation ) ? D-Case is the name of our research team for assurance cases. The letter "D" emphasize our focus on Dependability. Our team is one of the DEOS project teams. DEOS aims to develop dependable embedded systems.We observe assurance cases are crucial for sustaining dependability of systems in an open environment. For more details, please refer to our Inconsistency Robustness 2011 paper. Source code of D-Case Editor is available upon " a sub-licence agreement"
Note: This function may not have an enough function because of an alpha release version. All in one package including Eclipse platform. Note: Currently we experimentally release this software only in binary forms with the following restrictions: Among actions permitted in the conditions below, redistribution of this software and sale of products derived from this software are prohibited. In the next release, we plan to release this software without this note (2011.7.25). THIS SOFTWARE IS PROVIDED BY YUTAKA ISHIKAWA AND CONTRIBUTORS "AS IS" AND ANY EXPRESS OR IMPLIED WARRANTIES, INCLUDING, BUT NOT LIMITED TO, THE IMPLIED WARRANTIES OF MERCHANTABILITY AND FITNESS FOR A PARTICULAR PURPOSE ARE DISCLAIMED. IN NO EVENT SHALL YUTAKA ISHIKAWA OR CONTRIBUTORS BE LIABLE FOR ANY DIRECT, INDIRECT, INCIDENTAL, SPECIAL, EXEMPLARY, OR CONSEQUENTIAL DAMAGES (INCLUDING, BUT NOT LIMITED TO, PROCUREMENT OF SUBSTITUTE GOODS OR SERVICES; LOSS OF USE, DATA, OR PROFITS; OR BUSINESS INTERRUPTION) HOWEVER CAUSED AND ON ANY THEORY OF LIABILITY, WHETHER IN CONTRACT, STRICT LIABILITY, OR TORT (INCLUDING NEGLIGENCE OR OTHERWISE) ARISING IN ANY WAY OUT OF THE USE OF THIS SOFTWARE, EVEN IF ADVISED OF THE POSSIBILITY OF SUCH DAMAGE. Hajime Fujita, Yutaka Matsuno, Toshihiro Hanawa, Mitsuhisa Sato, Shinpei Kato, and Yutaka Ishikawa, "DS-Bench Toolset: Tools for Dependability Benchmarking with Simulation and Assurance,"42nd IEEE/IFIP International Conference on Dependable System and Networks (DSN 2012),8 pages,Jun.2012.(Accepted). Yutaka Matsuno, Kenji Taguchi: Parameterised Argument Structure for GSN Patterns, Proc. IEEE 11th International Conference on Quality Software (QSIC 2011), 6 pages, to appear, July 2011 (Short Paper). Yutaka Matsuno, Hiroki Takamura, Yutaka Ishikawa: A Dependability Case Editor with Pattern Library, Proc. IEEE 12th International Symposium on High-Assurance Systems Engineering (HASE), pp. 170-171, Nov. 2010 (Fast Abstract).